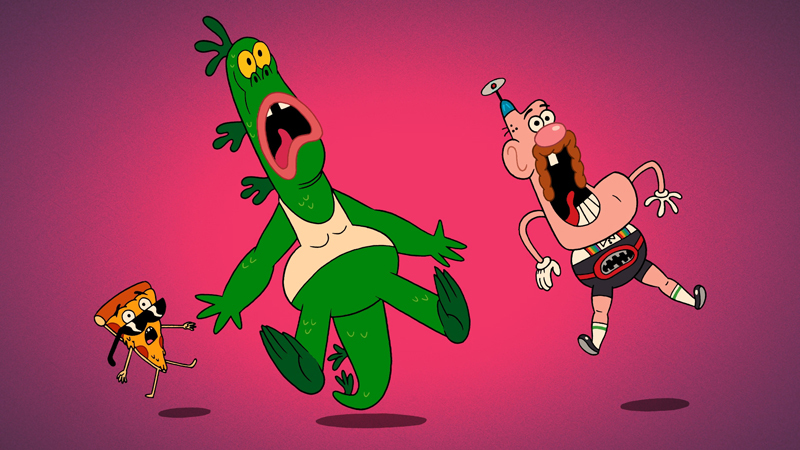 The manic minds behind the channel’s new 2D toon Uncle Grandpa give us a glimpse into their super-positive world. Most of us have memories of a special relative that made an impact on our childhoods by being so connected to his or her own inner child: The grandparent eager to kit out a pillow fort with all the trappings, the uncle who lets you drive his beat-up Chevy down the block. For these folks–and those who have tragically sober, boring families–Cartoon Network is delivering the ultimate expression of that can-do, magical mentorship with its new series Uncle Grandpa. 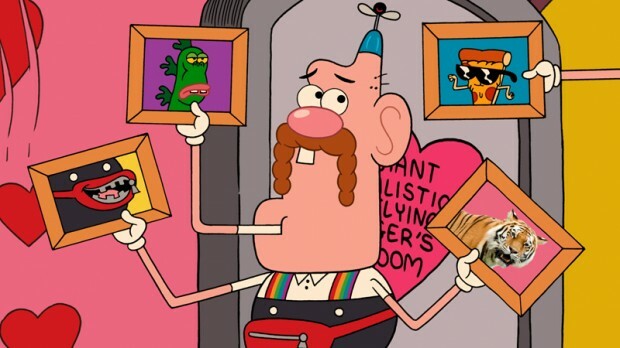 Created by Peter Browngardt (Secret Mountain Fort Awesome), the show centers on everyone in the whole world’s uncle and grandpa: Uncle Grandpa! Travelling around in his suped-up RV, the eternal optimist is willing to help out whenever, wherever and however he can, coming up with unusual solutions for any problem. 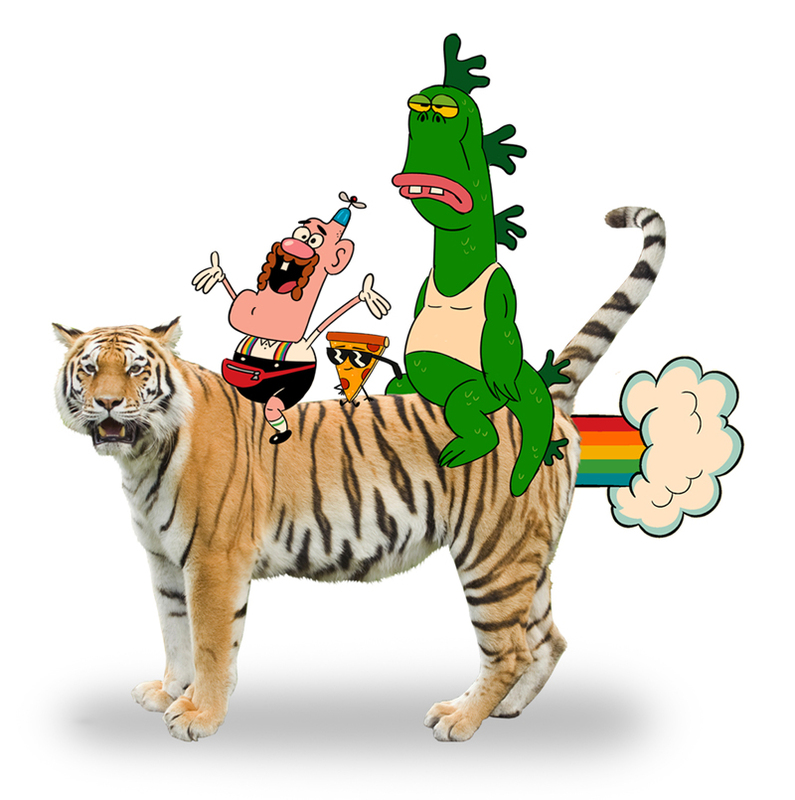 Uncle Grandpa (voiced by Browngardt) is aided in his cheery quest by his pals Belly Bag, a talking fanny pack (Eric Bauza); Mr. Gus, a dinosaur man Uncle Grandpa rescued as an egg (Kevin Michael Richardson); Pizza Steve, an egotistical slice of pizza who wears sunglasses (Adam Devine); and a realistic-looking tiger who flies with rainbow propulsion, named Giant Realistic Flying Tiger. Serving as Browngardt’s co-pilot on this animated road trip is creative director Audie Harrison, who was a storyboard artist on Secret Mountain Fort Awesome. But the duo have been friends and collaborators since long before their first TV project together: Browngardt and Harrison met on their first day at CalArts and went on to team up for short films and other side projects, even when they were a continent apart. Harrison previously worked in CG at Pixar and Nickelodeon and as a vfx artist for films like The Golden Compass. 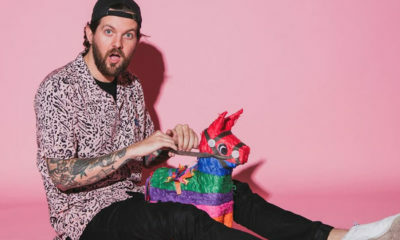 What’s more, their freshman year studiomate, Casey Alexander (SpongeBob SquarePants), is now the show’s supervising director–the reunion is “a dream come true” for the show’s creator. Like many of the network’s most successful series, Uncle Grandpa is a hand-drawn, 2D effort, with the team of between 20 to 30 artists putting stylus to screen at Cintiq workstations. (“I think there’s one person on the crew who still uses pen on paper, which we scan,” notes Browngardt.) 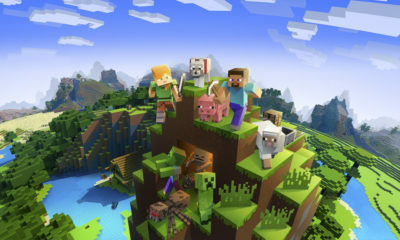 All pre-production–writing, storyboarding, design, color, etc.–is done at Cartoon Network Studios in Burbank, where they also handle post production after the animation comes back from service studio Rough Draft in Korea. 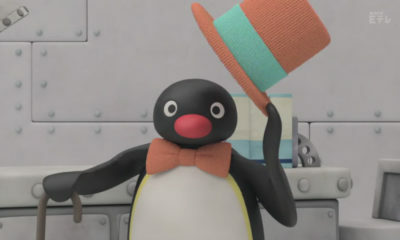 It takes about nine to 10 months to get an episode from script to completion, although Harrison points out this estimate is complicated by the series’ variety-show style format. Each episode, in addition to the main seven- to nine-minute story, features an original two- or three-minute short, plus a series of gag “bumpers” stringing it all together. The shorts are developed independently of the longer stories and are later mixed and matched with them. 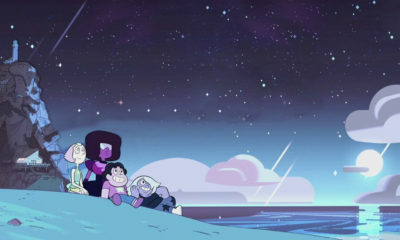 Currently, the shorts are created by show staffers, but Browngardt hopes to invite in guest directors in the future. 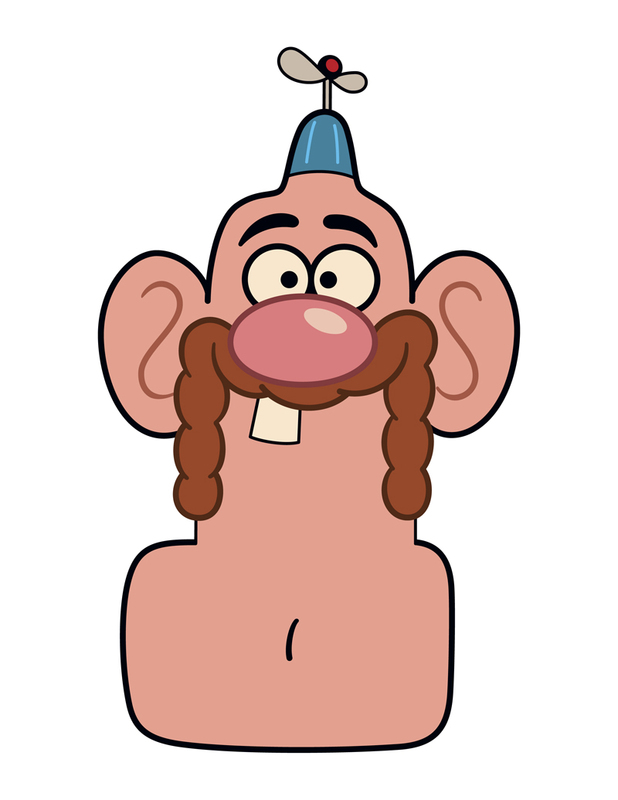 Uncle Grandpa‘s design further cements the characters’ antics in their own, pure cartoon world. Browngardt says his artistic style comes from influences he “can’t shake”–a blend of respect for the old school, ultra cartoony creations of Max Fleischer and Tex Avery as well as the influences of his ’90s childhood like Ren & Stimpy, MAD Magazine and the non sequitur humor of Gary Larson. Uncles and Tigers and Grandpas, Oh My! For the dynamic cartooning duo, one of the greatest challenges of creating the show was figuring out how to piece the eccentric characters and their stories together. Now that they are in the rhythm of working with these strange cartoon beings, Harrison and Browngardt say favorites are definitely emerging. Both love tackling the self-obsessed Pizza Steve. One of the most oddball characters (during our interview, the show heads could not even talk about her without breaking into laughter) is Giant Realistic Flying Tiger–the sole photo cut-out creature in the show’s 2D cartoon world. Browngardt and Harrison explain that GRFT is animated in a South Park-esque, flapping-head style–think jerky, early Flash videos made by crudely animating photos of celebrity heads. Highlighting her photoreal flatness, GRFT is animated using different tiger pics slapped together in Photoshop. “And the worse the Photoshop is, the funnier it is,” notes Harrison. With their magical mystery tour moments from its airdate, the creative pals are hoping that audiences will respond to the carefree comedy and enjoy it for its Devil-may-care wackiness without wondering why the proverbial coyote won’t give up on catching that darn roadrunner. Uncle Grandpa premieres on Cartoon Network September 2, new episodes air Mondays at 8 p.m.